Congress is enjoying their time off until Wednesday. 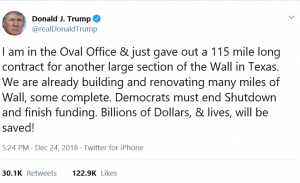 President Trump took to Twitter early Christmas Eve evening to brag about his latest border-wall accomplishment while blaming Democrats for the stalemate that has shut down part of the federal government. It’s unclear whether Trump’s tweet means a new contract or an existing one. Little headway has been made on the wall, despite Trump’s tweet, echoing one of his original promises as president while on the campaign trail. A March bill included money for 33 miles of barrier construction in South Texas’ Rio Grande Valley, but work there has yet to begin. Customs and Border Protection announced in early November a $145 million construction project was awarded to build roughly six miles of border wall in Texas. The agency, in conjunction with the Army Corps of Engineers, gave the multimillion-dollar job in the Border Patrol’s Rio Grande Valley Sector to SLSCO, which is expected to kick off in February. Other work has merely replaced existing barriers that had been deemed “ineffective,” not added miles. It looks like Christmas will be over and done with before the government will have a chance to get fully back to business. The incoming acting White House Chief of Staff Mick Mulvaney said the partial shutdown could drag into the New Year.